"We have elected people year after year that say, 'I'm going to do this for you,'" Bush replied. "Now it's time to strive for a society where there is equality of opportunity, not equality of results. [...] So I'm going to answer your question by saying, 'Probably nothing.' I think what we ought to do is to have a society where you go out and pursue your dreams and you're not punished." It was the "probably nothing" that cost him the election. But when the elections came around four years later, Bush got his act together and won. 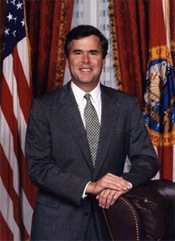 During his 2003 inaugural address, Governor Bush shared: "It is my most ambitious goal to provide the catalyst, in small ways and large, that will bring our families closer together. I, for one, intend to begin with my own family. Although it is an intensely private -- and at times painful -- matter, you should know I have rededicated myself to being a better father and husband." Afterwards Bush felt it necessary to clarify: "I wasn't saying that I'm a horrible dad." An avowed fan of the TV show American Gladiators. Was hired to be CEO Ben F. Love's administrative assistant at Texas Commerce Bank sometime in the early 1970s.